A few years ago I had the opportunity to listen to Damian Cooper (expert on assessment and evaluation here in Ontario) give a talk at OAME. He shared an analogy with us that I found particularly interesting. He talked about the Olympic athletes that had just competed in Sochi, specifically ice skaters. He asked us, who we thought made the biggest difference in the skaters’ careers: The scoring judges or their coaches they had throughout their careers? The scoring judge tells the skater how well they did, however, the skater already knows if they did well or not. The scoring judge just CONFIRMS if they did well or not. In fact, many skaters might be turned off of skating because of low scores! The scoring judge is about COMPETITION. Being accurate about the right score is their goal. On the other hand, the coach’s role is only to help their skater improve. They watch, give feedback, ask them to repeat necessary steps… The coach knows exactly what you are good at, and where you need help. They know what to say when you do well, and how to get you to pick yourself up when you fall. Their goal is for you to become the very best you can be! They want you to succeed! Thinking about this analogy, I can’t help but wonder how we might reflect on our own practices. In the everyday busyness of teaching, I think we often confuse the terms “assessment” with “evaluation”. Evaluating is about marking, levelling, grading. Any time we put a check on a question, a mark on the top of a page, or a grade or level on an assignment we are evaluating our students’ work. On the other hand, assessing is actually something quite different. The term “assess” comes from the Latin “assidere” which translates as “to sit beside”. Assessment is kind of like learning about our students’ thinking processes, seeing how deeply they understand something. It is a process where we observe our students in action to understand their thought process, consider what a student was thinking when looking at an assignment, listen carefully to students’ reasoning as they share with us and others. Assessment, while related to evaluation, are very different processes! Thinking again to Damian’s analogy of the ice skaters, I can’t help but think about one issue that wasn’t discussed. We talked about what made the best skaters, even better, but I often spend much of my thoughts with those who struggle. Most of our classrooms have a mix of students who are motivated to do well, and those who either don’t believe they can be successful, or aren’t as motivated to achieve. If we focus our attention on scoring, rating, judging – basically providing tasks and then marking them – I believe we will likely be sending our struggling students messages that math isn’t for them. On the other hand, if we focus on providing experiences where our students can learn, and we can observe them as they learn, then use our assessments to provide feedback or know which experiences we need to do next, we will send messages to our students that we can all improve. Hopefully this sounds a lot like the Growth Mindset messages you have been hearing about! Take a quick look at the video above where Jo Boaler shows us the results of a study comparing marks vs feedback vs marks & feedback. Are you assessing or evaluating most of the time? Can you see the difference? Do your students see you as their coach or as a scoring judge? How do you provide your students with the feedback they need to learn and grow? How do you provide opportunities for your students to try things, to explore, make sense of things in an environment that is about learning, not performing? What does it mean for you to provide feedback? Is it only written? How can we capitalize on using various students’ thinking to help each other improve? How do you use these learning opportunities to provide feedback on your own teaching? Let’s continue the conversation here or on Twitter! I find myself reflecting on what I believe is best for my students and best for my students’ beliefs about what mathematics is often. When I get the opportunity to take a look at my students’ work and time to determine next steps, I can’t help but reflect on how my beliefs inform what next steps I would take. However, I wonder, given the same students and the same results, if we would all give the same next steps? Let’s take a look at a few common beliefs about what our students need to be successful and discuss each. Often we see students who make careless mistakes and wonder why they could have gone wrong with something so simple. To some, the belief here is that if we could just memorize more facts, they would be able to transfer those facts to the problems in the assessment. While I agree that we want our students being comfortable with the numbers they are working with, I’m not convinced that memorizing is the answer here. Our Provincial test includes a few computation questions (for grade 3 only) and none of these are timed. Most of our questions involve students making sense of things (across 5 strands), some with contexts and some without. Instead of spending more time worrying about memorizing facts, I wonder if other strategies have been thought of to help our students as well? For example, other than the 4 questions in grade 3, all other questions allow students to use manipulatives or calculators, and all questions have space for students to write in the margins any rough work or visual models might be using. The question below is one of the few computational questions a grade 3 student is expected to do. Many who might use the traditional algorithm might accidently pick 41. How might a number line help our students visualize the space between the two numbers here? Often we notice that our students understand a concept, but the question itself requires several steps and students don’t end up answering what is asked. For many the solution is having students do some kind of strategy (whether they need to or not) like highlighting key words. I wonder what answer students might get to the above question? Will they get the right answer here? What would you have liked them to do instead? Highlighting specific words or filling out a standard graphic organizer isn’t the answer for all kids, nor for all questions! Personally, I think the issue isn’t that our students can’t read the questions, it is that they are jumping to a solution strategy too quickly. Instead of believing the solution is to have our students highlight or fill out graphic organizers, what might be more appropriate is to help our students slow down and think deeper about the questions they are being asked. I wonder, however, about how our students’ prior experiences might be a big part of why they jump to solution strategies too quickly? If students typically receive questions that are simple and closed, and typically follow a lesson directly telling us how to answer those questions, then I wonder if the issue is that our students can’t read or if their experiences have actually been counter-productive? If students don’t experience mathematics in ways that help them make sense of a situation, and instead see math as answering a bunch of questions, then it is no wonder why they aren’t reading the whole question! They have been trained to believe math is about getting answers quickly, and that we get rewarded (less homework, better grades…) when we are fast. What do you notice here? What do you wonder? What might our students see? They might notice things we didn’t realize they were not even aware of (e.g., each row has 7 boxes, some rows are missing numbers, the numbers go in order, there are 2 Ss and 2 Ts at the top, the letters at the top probably mean days of the week…..). What might our students be curious about? They might wonder why April 1st is on a Monday and not a Sunday. Or wonder about the “Chapter 1” part. Then we could continue to show more of the question and again ask what students notice and wonder. No matter the grade level or content, my students need to realize that mathematics is about the development of mathematical reasoning, not just quickly jumping to a solution strategy (especially not one that my teacher told me to use all the time). Taking the time to think deeply about our mathematics is what I want from my students! Numberless word problems, notice and wonder strategy, contemplate and calculate… any strategy that helps my students slow down, pay attention to visuals, and start to think about the situation more will probably help many of our students given enough opportunities. Many believe that if students are doing poorly on something, that the best course of action is to continue practicing that thing. For example, if our students are doing poorly on Provincial testing questions, then giving students more questions like these will answer all of the issues. 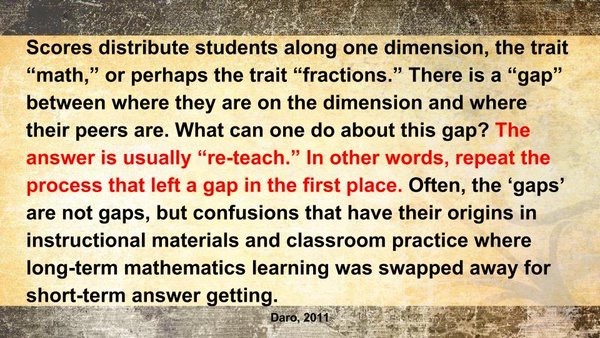 More often than not, the quick fix solutions like this (noticing our students struggle with something, then providing the same instruction or same types of practice again) will not be successful. Developing our math knowledge for teaching is probably the most difficult aspect of teaching mathematics, and is definitely NOT a quick fix, but it is probably the answer here! If our students are struggling with concepts we believe they should be able to do, it is likely that they haven’t had the right experiences to help them learn! Have we provided experiences for our students to deeply explore a variety of representations? Have we provided experiences where our students are able to develop reasoning skills? Have we provided ample opportunities for our students to consolidate their learning? Remember, questions that are designed to show evidence OF student learning is not necessarily the WAY students learn! Handing out these questions toward the end of the learning is far more reasonable. Often when giving young students extended time to sit and focus independently on an assessment task we have many that struggle to remain focussed. For some, the solution is to help students build stamina through quiet seat work regularly. While I do agree that we should have our students work independently at times, I’m not sure this is the answer to the stamina problem. To me, I think the issue has more to do with how our students experience mathematics. Do they get lots of short closed questions where the right answer is apparent quickly? Or do they experience rich problems where they reason through and figure out their own way of making the question make sense? Do they learn math through independent think time and cooperative problem solving, or are they told material then asked to remember all of the steps and terms. Is their mathematics class structured in a way where students come to rely on themselves (individually or within their group) to make sense of challenging problems, or do they feel the need to access their teacher every time they don’t know what to do? When our students are working, are we monitoring all of our students’ thinking, or are we spending a lot of time guiding our students’ thinking? If stamina is the issue, I wonder if we are allowing our students to productively struggle enough? If we see a bunch of hands raised around the classroom all wanting us to help, this is a huge red flag moment. Our students are asking US to think for them! If we find ourselves sitting beside our students helping out a small group all of the time, this might be another red flag. Our students are learning that they always have access to us right beside them when they learn, but the unintended problem is that we aren’t allowing our students to struggle enough! When our students learn their mathematics using manipulatives and have access to any manipulative at any time to solve new problems, we start to notice that our students come to realize their role is to slow down and make sense of things. When our students have had various experiences with manipulatives and can see their role as “thinking tools”, we start to notice fewer hands asking for help, less need to have to sit down with a group, and more time for us to really notice our students’ thinking going on in our classroom. When this starts to happen, we no longer see stamina as a big issue. I want you to consider for a moment the differences between the beliefs I’ve mentioned. What messages are we sending to our students about what is important in mathematics? Strategies that get us to do better on the test, or strategies that help us slow down and think more? Is math about memorizing or figuring things out? Is math about removing the context to mathematize a situation, or about using the context to make sense of things? Sure I want my students to do well on any assessment they are given, but I want them to do well every day! Quick fixes and silver bullets often don’t help our students in the long run though!!! What are some of the quick fixes you’ve heard about? Did you try any of them? Did they work? Is there a strategy that you see working for all of your students? Was it actually helpful for everyone, or just some? Do you expect everyone to use this strategy? Have you been asked or told to use specific strategies? Do you see it being successful for everyone? Do you have the autonomy to choose here based on the students you have in front of you? Do your students have any autonomy over the strategies they use? When looking at your student work, are you determining next steps for your students, or for yourself? It is far easier to determine what your students can and can’t do well, than it is to figure out what to do next. While we absolutely need to help our students notice the things they could do to improve, we also need to do the hard work of reflecting on our own practices. Our beliefs about what is important and how we learn mathematics have a direct effect on how our students will do in our classrooms!